In cinematography, a jib is a boom device with a camera on one end, and a counterweight and camera controls on the other. It operates like a see-saw, but with the balance point located close to the counterweight, so that the camera end of the arm can move through an extended arc. 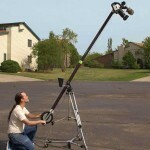 A jib permits the camera to be moved vertically, horizontally, or a combination of the two. A jib is often mounted on a tripod or similar support. A man operating a camera jib. Photo by Henry Nelson, Wichita Kansas, USA, www.henrynelson.com under a CC-BY-2.5 license. 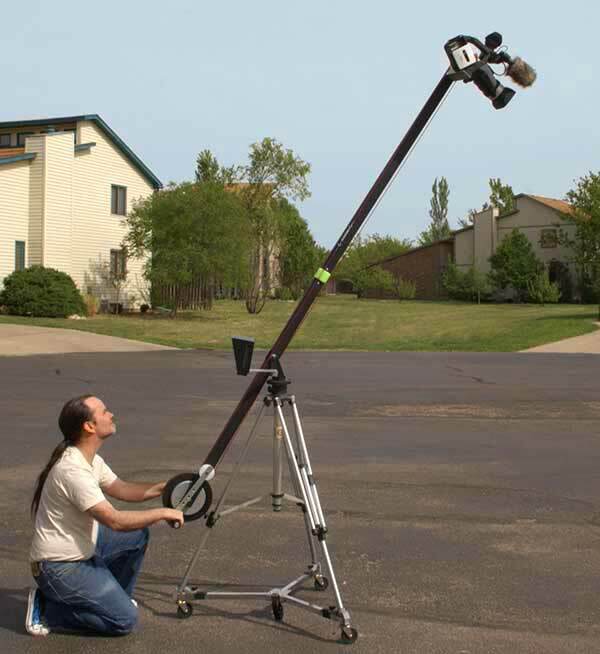 A jib is useful for getting high shots, or shots which need to move a great distance horizontally or vertically, without the expense and safety issues of putting a camera operator on a crane for a crane shot or laying track for a camera dolly. A jib can even be mounted on a dolly for shots in which the camera moves over obstacles such as furniture, when a normal dolly shot could not be used.